Here’s the Disney World Enthusiast Weekly Round Up for April 21, 2019! In Epcot’s Future World near the Fountain View Café is a fantastic spot to explore called Club Cool. This location has lots of fun Coca-Cola merchandise, plus it offers free unlimited self-serve samples of Coke flavors from around the world. The tastes range from awesome to awful which adds to the entertainment value. I have a hilarious photo from the first time my son tried the Beverly. Beware – that flavor is only for the adventurous! So when you get hot and thirsty, be sure to stop in. Looking for more tips like this? Click here! Mickey Mouse has more than 136 different sets of duds, ranging from a scuba suit to a tuxedo. Minnie Mouse’s wardrobe contains more than 100 outfits, including everything from a cheerleader ensemble to evening gowns. 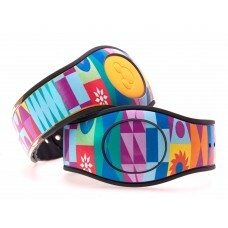 Create your own unique look with a personalized Disney MagicBand Skin. Magic YOUR Band has a range of designs to choose from that you can use as-is or customize with your own text. And if you want to take it to the next level, you can even upload your own photos or images to fully personalize, customize, and decorate your MagicBand. With great discounts for multi-buys, why not create one for the whole family? For more information or to start customizing your own Magic YOUR Band Skin now, please click here. UPDATED! The difference between an average and an outstanding Walt Disney World trip is in the details. Kristi Fredericks helps make your dream vacation a reality with her numerous tips and tricks to save money, time, and sanity while at the happiest place on earth in her new book “501 Ways To Make The Most Of Your Walt Disney World Vacation”. For more information, to read an excerpt, or to purchase, please click here. Jennifer Hardy, a Disney Vacation Planner with Destinations in Florida, is the official travel partner of Disney World Enthusiast. She can help you book your next Disney vacation whether it is to Disney World, Disneyland, or aboard the Disney Cruise Line. Currently Jennifer has some incredible deals for discounted travel to Walt Disney World. For more information about Jennifer’s amazing and absolutely free services or to get a free no-obligation quote, please click here! Jennifer Hardy, from Destinations in Florida, and I have teamed up to create a brand new Facebook Group called Next Disney Vacation! It is the perfect place to talk about your next Disney vacation, voice your opinions, ask your questions, get them answered, and share the magic. Whether it’s Disneyland Resort, Walt Disney World, or the Disney Cruise Line, Jennifer and I are ready to help. Everyday you’ll find posts, photos, trivia, tips, and more that we find all throughout the Disney Universe. If you’re counting the days until your next Disney vacation or just dreaming of one, we would love to have you join in the fun and conversation! Please click here to be a part of our group! Next week I’ll have some planning information plus all of the latest Disney World news!